An air rotary valve is used for clamping the cylinder on a rotary table. Autogrip’s unique design uses high-quality materials and a special feature, which eliminates oil leaks. 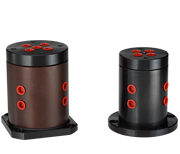 Choose from a single or a double circuit clamping option. To avoid back pressure, air rotary valves require a drain port to be independently connected to the oil tank.